Rickenbacker International Corporation - Forum • View topic - Fantasy Rics - for a bit of fun! Fantasy Rics - for a bit of fun! Post subject: Fantasy Rics - for a bit of fun! Would go with the 'R' tailpiece as its so iconic, but white pick guard and TRC as my colour would be.... FireGlo but going to a deeper almost burgundy red. Can I place my custom order now Mr Hall ? Post subject: Re: Fantasy Rics - for a bit of fun! Three pickup 620 (Which would be a 630? *Shrugs*) with a humbucker as the neck pickup. 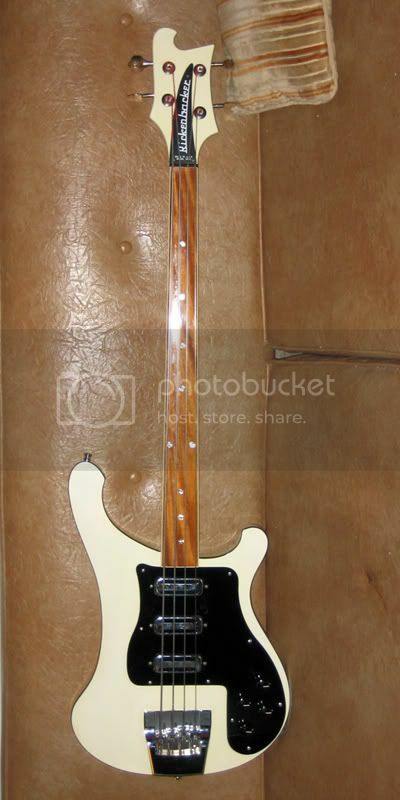 I have two fantasy Rickenbacker bass guitars in mind. One would be a bass version of the 381 guitar, I would even go for a 330 version of a bass guitar. The other would be a 4001V63 built like a 4004. 4001V63 body, but no pickguard, controls mounted through the back like the 4004, but with three pickups. Two of the pickups would be positioned just as they are now on the 4004 and the third pickup would go right before the bridge, like on the 4004LK. Hm, my fantasy Ric is pretty much real nowadays. 1. The working parts of a 650 with the cosmetics of a 620. Call it a 640? - Four double-strung courses tuned like a cello. - The nut and bridge would be fairly straightforward to get, but the headstock would require major surgery. 650's come with a maple board.